The HP t5740 Thin Client provides an optimized Windows, Citrix and VDI client virtualization experience with a breakthrough combination of performance, efficiency, and affordability. With no hard drive, fan or other moving parts, thin clients have a much longer lifespan than standard computers and use significantly less power. The HP t5740 Flexible Series Thin Client is designed with the latest technologies to deliver a true PC experience. With flexible expansion capabilities, the t5740meetsthe requirements for Today's desktop and tomorrow’s client virtualization environments for maximum longevity. TheHPt5740 combines the Intel AtomN280processor andGL40chipset, DDR3 RAM, and native dual-monitor support with VGA and DisplayPort connectors for impressive price/performance. HP boosts the user experience even further with comprehensive multimediaandUSBredirection support, including HP RDP enhancements and Citrix SpeedScreentechnology, and support for HP RemoteGraphicsSoftware. The low-powerHPt5745meetsstringent requirements and complies with the EU's Directive. Experience broad application flexibility with Windows EmbeddedStandard2009includingchoice of write filter, support for local applications, a full browser, and extensive terminal emulation.Easily extend the life of the system with a simple memory upgrade in the open RAM slot, add in cards to the optional PCIe or PCI ExpansionModuleor expand storage with a secondary solid-state flash drive. Connect a variety of peripherals with eight USB 2.0(including two in a securable compartment) and legacy ports. Use thestandardGigabit Ethernet or choose the integrated wireless. Make the most of your workspace by using the HP t5740in a horizontal or vertical position, mounting it under a desk or on a wall with the optional HP Quick Release, or adding the HP Integrated Work CenterStand for all-in-one convenience. Quickly deploy simple, familiar and more reliable computing experiences with the HP t5740’s enhanced user interface and included HP RDP enhancements software for a rich client virtualization experience. Pre-loaded with the industry’s most comprehensive management offerings for SMB to an enterprise, HP thin clients can be easily managed from a single console, freeing IT staff from common PC break/fix and help desk tasks and leaving more time for strategic IT. 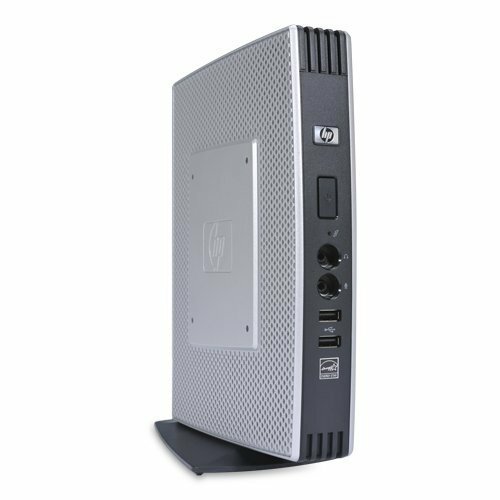 With the HP t5740 thin client at the desktop, HP’sprovenportfolioofdesktop-to-datacenter hardware, software, and services will help you create a thin computing solution that improves your IT and user experience.HP t5740 Thin ClientPC Performance, Thin client dependability. Established in the year 2014 at Mumbai, Maharashtra, we “Egreen Tech” is a Partnership, involved as the trader and importer of Thin Client. These products are known for their best quality and fine finishing at the reasonable price in the stimulate time duration. The quality of these products is maintained by our experienced professionals.